Fishing is one of the most popular hobbies and pastimes for those who love both the challenges of the sport and enjoy the incredible natural beauty of the world's most popular fishing destinations. Of course, there are as many fishing styles as there are different waters - but for those who want to explore the possibilities for adventure and fishing challenge there is one destination that stands head and shoulders above most others - and that can be found in the deep salt waters of our seas and oceans. Deep sea fishing remains a popular choice for both beginners to the salt water experience and for more experienced fishermen (and women). The choice of just how to enjoy the deep-sea fishing experience is of course up to the individual or group. However, the most popular way to get your feet wet (so to speak) when it comes to immersing yourself in the deep sea fishing experience is to charter a vessel with a knowledgeable crew who will make it their business to ensure that the day (or days) spent wetting lines is as rewarding as possible. However, there are ways that the deep-sea fishing enthusiast can ensure that their fishing charter delivers on its promise. 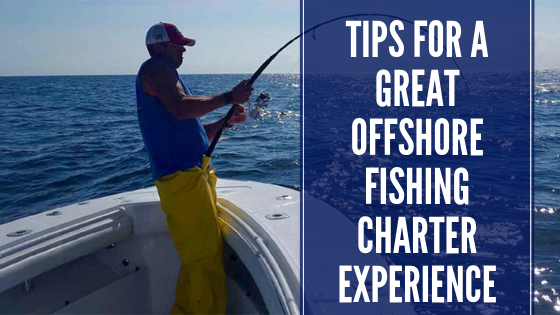 Here are some tips to make sure that the offshore saltwater experience justifies the money that is spent. Here are a few tips. Firstly, before choosing your charter that you have discussed the budget with the fisherfolk who will be taking part in the activity. Costs can vary wildly depending on what is on offer. A day's offshore fishing can cost as little as $50 per person, while an overnight excursion can cost 10 times that amount. Make sure that your expectations are in line with how much money you are going to be spending. there's very little point in the exercise if you are going to spend your time on the water worrying about cost. Secondly - do a little research about the Captain and the crew - as well as the fishing vessel. Ask about licensing and the vessels service history. It also never hurts to listen to the locals (not the salespeople) and even ask for references prior to setting foot on board. Make sure that all safety equipment is in perfect working condition and has been maintained to the highest standards. Safety is key - and a large part of ensuring that safety is to be absolutely sure that you are in communication with those on shore. A satellite phone is a handy tool to make sure that you can get in touch with land-based contacts. In addition - always inform people where you are going and how long you expect to be on the water. Make sure that the fishing equipment that is supplied by the tour operator is in great condition (if you will not be bringing your own). Once again establishing costs is important. Make sure that there are no hidden charges for the use of the equipment. Also, make sure that you will be allowed to take your catch home - some Captains keep a portion for the boat and in some areas only catch and release is allowed. Finally - if you are prone to seasickness take medication. Nothing will ruin your offshore experience faster than a bout of nausea. A few sensible steps will ensure that your deep-sea fishing experience delivers both adrenaline and fun - and memories that will last a lifetime. Plan properly and you will treasure your time on the salt water.